On August 29th, 1944, a group of Holocaust survivors gathered in Lublin to set up the Commission for the History of the Jews. It took place a month after Lublin was liberated from German occupation. The Jews living there had already organized the Jewish Committee, addressing a multitude of everyday problems. The next task, to which the survivors considered themselves called, was to collect and store testimonies about the Nazi genocide, and in a longer perspective – to publish and share them in order to make the world learn the truth about the Nazi crimes. The Historical Commission in Lublin was a disparate group of people, with no background in history. Despite the initial plans, the work collecting the testimonies advanced slowly. In our archive there are only 12 testimonies collected in Lublin, dated 1944. Most of the founders of the committee did not take part in the gathering of testimonies; none of them decided to include the record of their own experiences among the testimonies they collected. Their activities gained momentum only when the nationwide Central Jewish Historical Commission was set up in Lublin in December 1944. Soon after, large areas of the central Poland were liberated thanks to the January offensive of the Red Army. The Jews in these territories could then come out of hiding and become the authors of the testimonies. The first record in the collection of the Jewish Historical Institute (file no. 301/1) is a testimony of Alter Ogień, born in 1910 in the township of Krasnosielc, district Maków Mazowiecki. 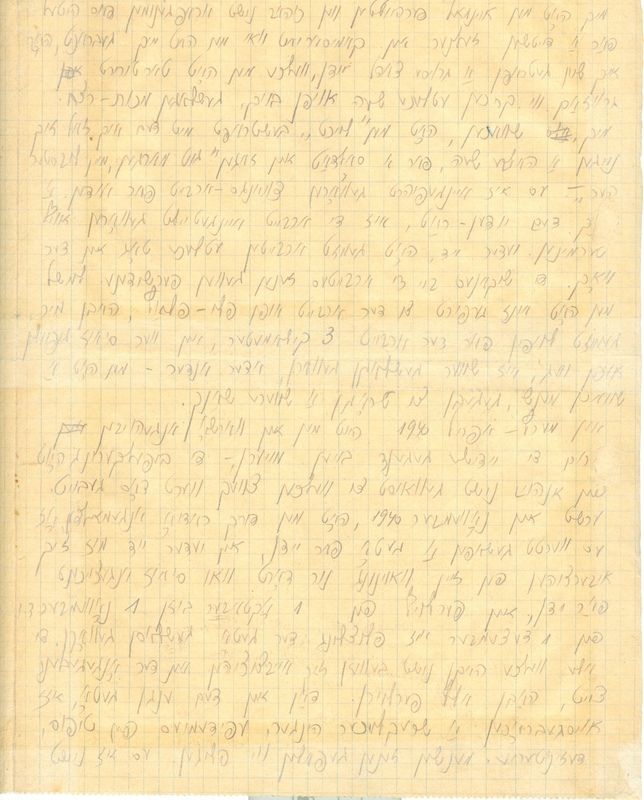 On September 2nd, 1944, Marek (Menachem) Asz wrote down his testimony in Yiddish, using a pencil. We know little about the author. Alter Ogień was a tailor by profession; before the war he lived in Warsaw. His fate was fairly typical: he escaped from the Warsaw ghetto to the province (the town of Łęczna), and when the extermination began there, he hid in the countryside (later his wife joined him), and with the help of a trusted Pole by the name of Włodarczyk he survived until liberation. Unfortunately, when describing the general situation of Jews in the ghettos in Warsaw and Łęczna, Ogień said little about himself. We do not know, why he chose to leave Warsaw for Łęczna, and not elsewhere. We also do not know under what circumstances he met Włodarczyk, or in which exactly village he hid (on the list of Jews residing then in Lublin, there’s only the information that he came “from the country”). As a matter of fact, the cognitive value of the Kalman Ogień testimony is quite limited. He devoted most of his attention to living conditions in the Warsaw ghetto, well known from many other sources. More important is what he wrote about the situation in the ghetto in Łęczna, but the JHI collection also contains 5 other testimonies from this town, some of which are longer and more detailed. Alter Ogień also said almost nothing about his experiences in hiding. Perhaps this was due to the assumption made by the person who wrote the testimony, that the fate of the Jewish community was important, not the way of survival of individuals. We decided to focus on Kalman Ogień’s testimony primarily because of its position as the beginning of the entire record group. His testimony – even if it was not the first one recorded in liberated Lublin – was the first one to be included into the collection of testimonies of the Central Jewish Historical Commission, which has been expanded over several decades by JHI and today has over 7000 items. Alter Ogień, his wife Rajzla and his son Anszel, born in 1945 in Lublin, moved to Legnica in 1946. They applied for a US visa, and in June 1946 they received an affidavit (a statement whose author promised to support new immigrants after their arrival in the United States) from Rabbi E. I. Segal from Memphis (Tennessee) through the American Joint Distribution Committee. Providing the documents to the Ogień family, the Joint informed them at the same time that they could not yet receive US visas due to the fulfillment of quotas. There is no further information about the fate of Alter Ogień in the documents stored in the JHI archive.